Last week I shared the idea of DataForager, a browser-based tool to support question-centric research and sharing online (DataForager slides here). This week, I built my first prototype. 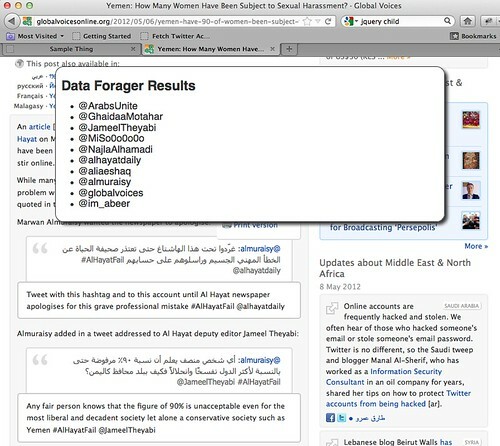 The prototype of Data Forager detects twitter handles within a web page. Since WordPress mangles links you will have to find it here. If you drag the DataForager link to your bookmarks bar, you can activate it on any page, such as this article on Global Voices. At present, DataForager doesn’t work on al Jazeera’s embedded Storify stories due to Cross Site Scripting security stipulations in browsers. A future version of DataForager will use JQuery to fetch the iframe data for parsing, without crossing security restrictions. Now that I am successfully collecting Twitter accounts, my next step is to automatically create or extend a twitter list from this data. I had hoped that it would be possible to use third-party software for this, but I can’t find any third-party software that creates a Twitter list from a set of Twitter accounts. So I’ll have to integrate something into Data Forager itself. Once DataForager is able to save to a Twitter list, it will be ready for use in reporting stories. This entry was posted in All, Final Projects by natematias. Bookmark the permalink.